Before I start my tirade against Joe Sitt’s Memorial Day desecration of Coney Island’s C-7 amusement district, if you’re wondering “Are the rides and games open at Coney?” the answer is YES! The REST of Coney Island–Boardwalk and beach, rides, games, sideshows, food, drinks– is alive and kickin’! Thor Equities does NOT own the entirety of Coney Island, though you’d never guess it from the Sitt-centric Festival by the Sea posters in the subway. The May 15 grand opening of Joe Sitt’s flea market was postponed due to threat of bad weather on a sunny day, but on Memorial Day Weekend the rescheduled less than grand opening took place under the open sky. 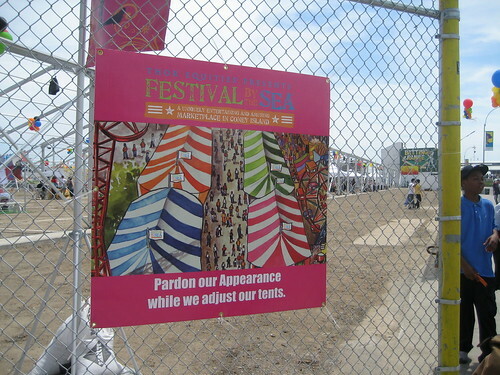 Last weekend’s “Closed due to threat of bad weather” sign was replaced by one that read “Pardon our Appearance while we adjust our tents.” Translation: The City’s DOB is requiring that the tents and structures be able to withstand hurricane force winds before issuing a C of O. Despite Thor Equities much vaunted $250K advertising campaign with full-page ads in the New York Post, Time Out New York, AM New York, plus subway advertising and Google ads, vendors were sparse over the Memorial Day Weekend. On Friday, a couple dozen vendors set up in preassigned spaces and were scattered throughout the huge tentless structures on both sides of Stillwell. 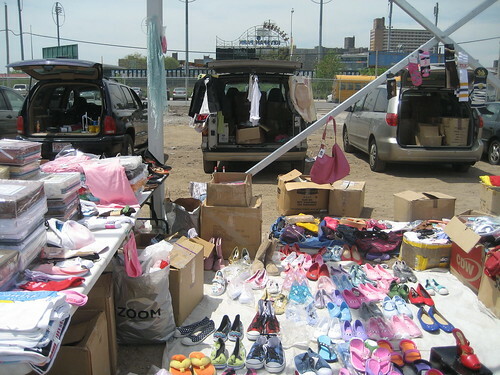 Most of the booths were selling clothes, new and used. Vendors specializing in auto supplies, housewares, Arbonne cosmetics, a water filtration system, Hawaiian noni juice and credit counseling also made an appearance over the three-day weekend. Here is my set of flickr pix of Thor’s attempted flea in-fest-ation of Coney Island. Stands selling clothing and shoes were a reminder that Thor Equities pitch book unsuccessfullly used to lobby BP Markowitz for 10,000 square feet retail touted flagship retailers such as Abercrombie & Fitch, Gap/Banana Republic, and DSW (“Thousands of shoes…prices you love”). One vendor told me she was given a free space on Friday to compensate for the time and trouble of having showed up last week for nothing. Several others said rent had been temporarily reduced from $100 a day to $20. Despite the bargain basement prices, many said they wouldn’t be back next weekend. 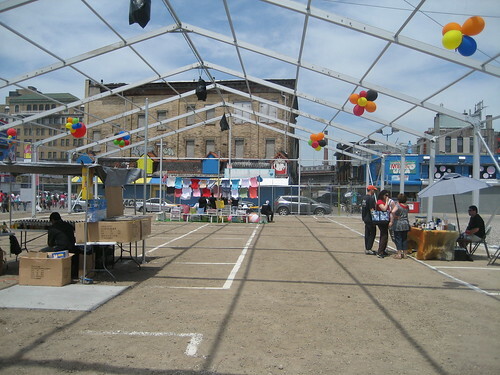 On Saturday the flea management moved all of the vendors to the east side of Stillwell, leaving the tentless framework behind Nathan’s completely empty. On Surf Ave. I ran into a man and his son carrying a display rack with repros of his Coney themed artwork. Five dollars apiece. The man said he decided NOT to rent space at Thor’s festival after seeing the miserable setup. He also didn’t like the dirt ground of Sitt’s space. Instead he walked around Coney Island all day and was pleased to have exercised his first amendment rights by selling about $100 worth of his artwork without paying any rent. 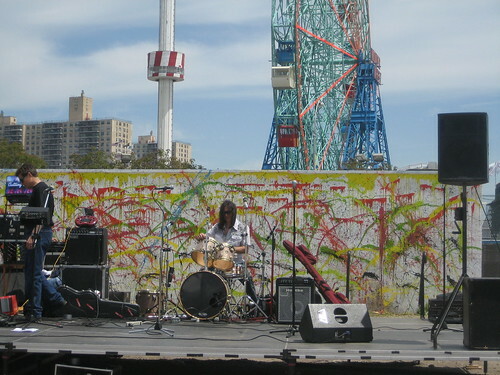 The entertainment at Thor Equities self-described “uniquely entertaining and amusing marketplace in Coney Island” consisted of a band playing two sets. So I guess this makes the flea legal in the C-7 amusement district? Loophole in the law or flagrant violation? In March Joe Sitt’s newly registered to do biz in NY state Delaware LLC “Chart Development Company” successfully applied for a DOB permit for a “temporary fair” after an earlier app for a “flea market” was disapproved. What used to be here? The Tornado Roller coaster (1927-1977), the Bobsled (1941-1974), and Stauch’s Baths and Dance Hall (1930-1998). An aerial view of the amusement district looking west from the Astro Tower in the 1970s shows Stauch’s Baths, the Wonder Wheel, the Tornado and Thunderbolt roller coasters and the Bobsled ride. In recent years, popular amusements such as the Bumper Boats, Go Karts, Climbing Wall, Batting Cages and Mini-Golf thrived here. Visitors to Coney still ask what happened to them: Bulldozed in February 2007 by Joe Sitt who was eager to get an early start on “site prep work” though nothing could be built there until the rezoning was done. Site prep work = Deliberately created empty lots. 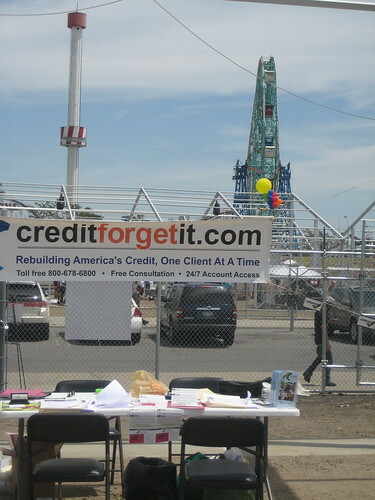 Joe Sitt’s Memorial Day Weekend flea in-fest-ation is a desecration of Coney Island’s C-7 amusement zone! 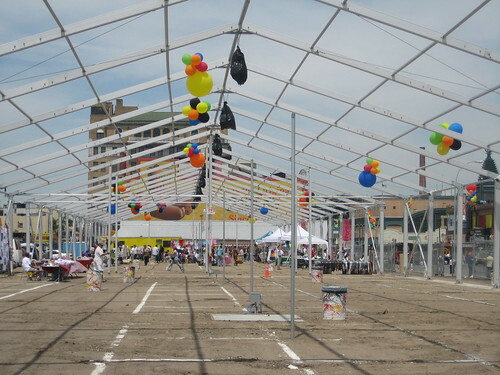 The rash of press releases from Thor Equities touting their so-called “Festival by the Sea” fails to mention that Joe Sitt created the empty lots where he put his flea market. That area was NOT rundown until Sitt emptied it out to blight the property in hope of getting it rezoned for big box retail and high rises. There were thriving amusements here when Joe Sitt bought this property from Hy Singer. He evicted the amusement operators and made empty lots. Sitt wants to erase those rides and attractions from our collective memory to make way for a tented shopping mall followed by a permanent shopping mall. 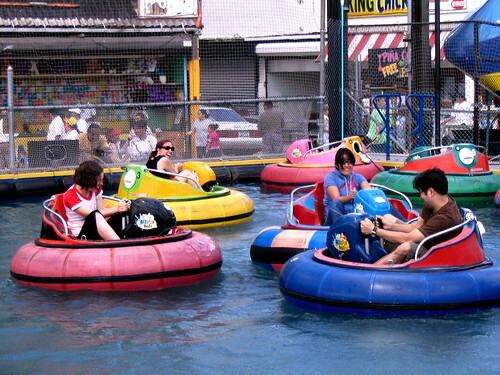 Want your Bumper Boats, Go-Karts, and Batting Cages back? Here’s what you can do to Save Coney Island’s amusement zoning now! 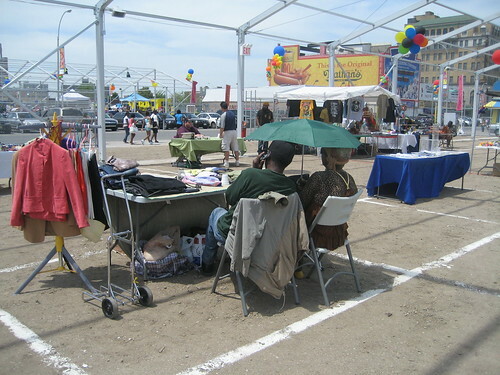 May 17, 2009: No C of O for Thor Equities Tents, Coney Flea Fest Postponed! I actually got invited to the ribbon cutting ceremony. First, the property was supposed to be wheelchair accessable (not). Second, many people knew something because not a single public official showed up to the ribbon cutting. I have to admit, the food was apleanty for those of us that weren’t in the know. This FLEA was beyond pathetic. Coney island would be better off setting up the old containers stores (these were tanker containers set up as stores into a long term flea market by residents of the area. They were driven out by Keyspan in their development plan of the area).